Among the logistical marvels which made the US Navy so successful in the Pacific War of World War II were various kinds of floating dry docks it could deploy into areas close behind the westward-moving ‘front line’. These could be towed to advanced bases by tugs, and were designed and delivered in a variety of sizes to accommodate most of the US Navy’s combat and auxiliary vessels. Planning for floating dry docks was prompted by the fortifications clause of the Washington Naval Treaty, which was signed by the USA, UK, Japan, France and Italy on 26 February 1922, with the exchange of ratifications following on 17 August 1923, and registration in the League of Nations’ treaty series on 16 April 1924. This Article XIX forbade any further development of fortifications and bases in the western part of the Pacific Ocean, and was in itself a significant victory for Japan, as US and British fortified bases would pose a serious problem for the Japanese in the event of any future war. The provision of the treaty essentially guaranteed that Japan would become the dominant power in the western part of the Pacific Ocean, and was crucial in gaining Japanese acceptance of the limits on capital ship construction. The US’s response in an attempt to offset this Japanese advantage included the development and construction of floating dry docks as a matter of high priority, and the resulting docks came to be seen as an important ‘secret weapon’ in the event of war with Japan. Plans were considered for giving the largest floating dry docks their own propulsion plants to increase their mobility, but peacetime funding restrictions meant that the process of designing and building floating dry docks took place only slowly during the 1920s and 1930s. At the time war broke out in the Pacific on 7 December 1941, the US Navy had three steel floating dry docks. One of these, YFD-2, was assigned to Pearl Harbor and was occupied by the destroyer Shaw when Pearl Harbor was attacked by the Japanese in the ‘Ai’ carrier borne air assault. Both the destroyer and the dry dock were badly damaged, but were subsequently repaired. Another of the docks was Dewey at Olongapo in the Philippine islands group, and was scuttled to prevent it falling into Japanese hands as the Japanese seized Luzon Island. The third was ARD-1, which had been built in 1933 to a sophisticated design, was designed to be self-sustaining, once towed into place at an advanced base, and therefore possessed its own ballast pumps, power station, machine shops and crew accommodation, able able to lift ships of up to 2,200 tons. This too was assigned to Pearl Harbor. Capitalising on the success of ARD-1, the US Navy ordered the construction of another 30 Auxiliary Repair Docks (ARDs) during World War II, and most of these were completed between 1942 and 1944. Six of the docks were 485 ft 8 in (148.0 m) long and could accommodate a ship 413 ft (125.9 m) long, 49 ft 4 in (15.0 m) wide and displacing upward of 3,500 tons. Thus these docks were sufficient for a destroyer or a submarine. The clear width of the other ARDS was increased to 59 ft (18.0 m) to permit the accommodation of a tank landing ship. The Auxiliary Floating Docks (AFDs) were of welded steel construction, with a length of 200 ft (61.0 m) and width of 64 ft (19.5 m), and could lift a ship 45 ft (13.7 m) wide with a displacement of up to 1,900 tons. Thus the AFDs were suitable for repairs to smaller landing ships, minesweepers and patrol craft. The first AFDs were completed at a time late in 1943, and about 34 such units had been built by the end of the war. By 1943, steel had been deemed a critical resource, and the US Navy ordered the construction of 13 dry docks in concrete. Each of these units had a capacity of 2,800 tons, which was sufficient to accommodate a large destroyer, and its dimensions were 389 by 84 by 40 ft (118.6 by 25.6m by 12.2 m). Each of these units had a floor divided into 12 compartments with a dry passage for personnel, and was fitted with a 5-ton crane on each wing wall. Of the 13 such units, six were outfitted with Diesel generators and manned by crews of five officers and 89 men for independent operation, and the other seven remained in developed ports. These concrete docks proved durable, and were surprisingly popular with their crews, as their massive construction provided considerable stability, and the considerable ballast represented by their lower hulls meant that the wing walls could be outfitted with extensive crew facilities. 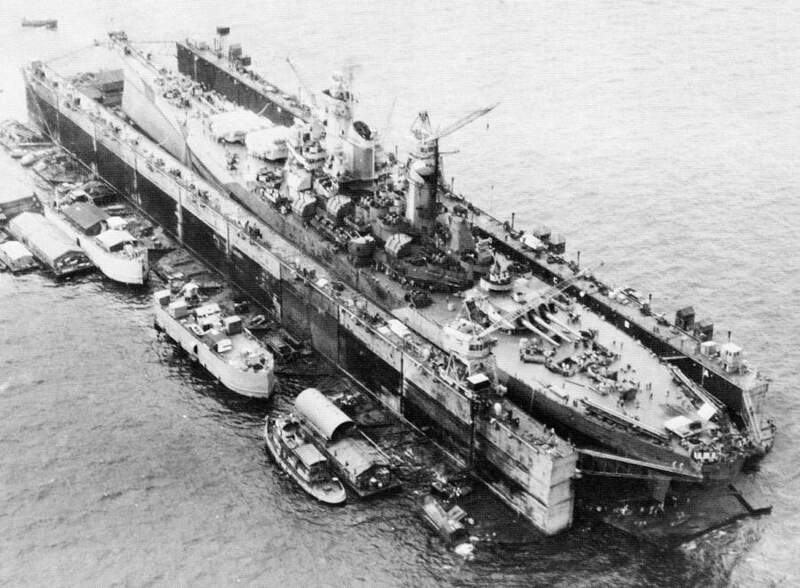 The Advance Base Sectional Docks (ABSDs) were huge floating docks, and were built in sections. The individual sections were small enough to withstand the stresses of being towed in heavy seas, and were then welded together once they arrived at the intended advanced base. The ABSDs were of two sizes, with the larger units built of 10 sections, each 256 ft (78 m) long and 80 ft (24.4 m) wide, and provided a lift capability of 10,000 tons. These were welded together to produce an assembled dock 927 ft (282.5 m) long and 256 ft (78 m) for the lift of a warship 827 ft (252 m) long, 133 ft (40.5m) wide and possessing a displacement of as much as 90,000 tons. The ABSD could therefore accommodate any ship in the US Navy’s inventory. The smaller version came in seven sections, each 204 ft (62.2 m) long and 101 ft (30.8 m) wide, and provided a lift capability of 8,000 tons. When assembled, it could lift a ship 725 ft (221 m) long, 120 ft (36.6 m) wide and possessing a displacement of as much as 55,000 tons. The sections possessed an approximate hull form, and this permitted them to be towed at speeds of between 6 to 8 kt; their side walls were folded down to reduce wind resistance and at the same timer to lower the centre of gravity. The units possessed their own Diesel generators and crew quarters, and each assembled dock was characterised by a pair of cranes, with a lift capability of 15 tons, and these ran on rails above the assembled walls of the dock. Some 58 ABSD sections were constructed during the war, which was sufficient for three larger docks and four smaller docks. The first ABSD was assembled at Nouméa on the French island of New Caledonia during 1943, and a second was being assembled at Espíritu Santo, in the New Hebrides islands group, at the end of the year. The ABSD was in theory capable of disassembly for movement to another location, but this was attempted only with ABSD (later AFDB-1 Artisan) at Espíritu Santo, which was moved to the Philippine islands group, much closer to the ‘front line’, just as the war was coming to a close. The total US Navy floating dry dock capacity increased from 108,000 tons at the end of 1942 to 723,000 tons at the end of 1943. My grandfather served on ARD1 in 1944.